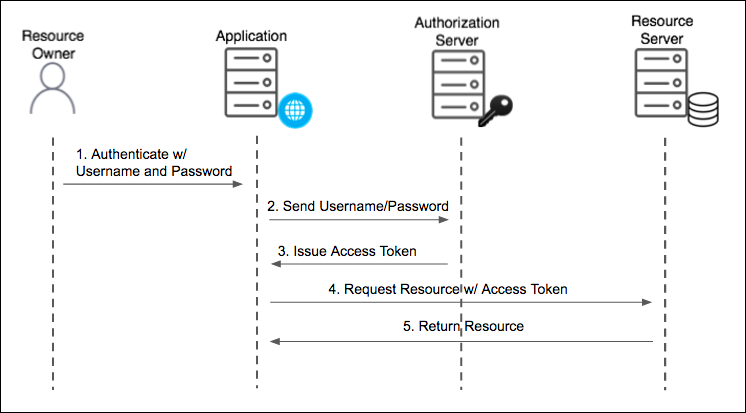 For Native Mobile and Desktop applications, Pivotal Single Sign-On (SSO) supports the Resource Owner Password OAuth 2.0 grant type. This password grant type is for highly trusted applications where resource owners share their credentials directly with the application. The following diagram shows the authentication flow used by mobile apps. In this scenario, the application is backed by a resource server and both are secured by the UAA authorization server. Authenticate w/ Username and Password: The user authenticates with the application using their username and password. Send Username/Password: The application sends the username and password to the authorization server for validation. Issue Access Token: The authorization server validates the username and password and issues an access token.